Christmas came early this year. 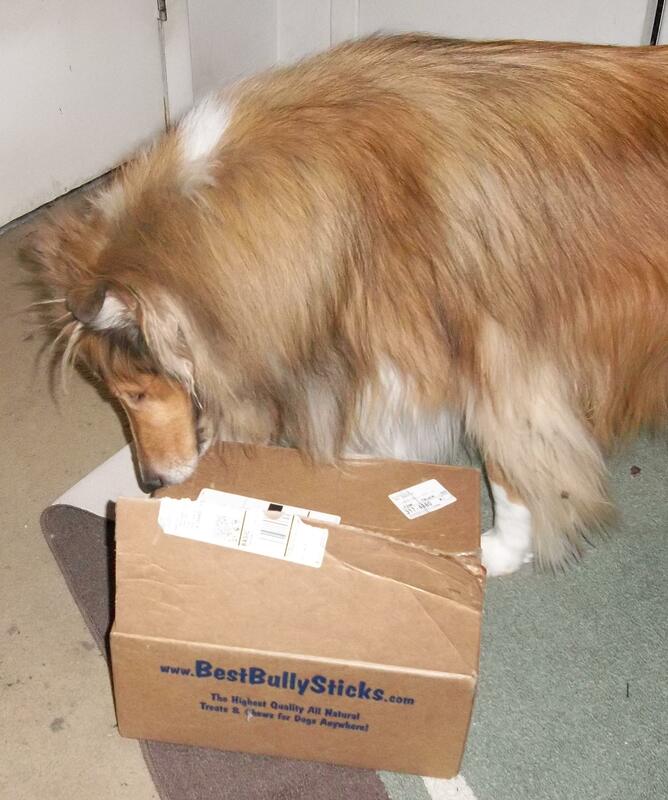 Our order from Best Bully Sticks arrived today! I know some people never give their dogs chews. I think they worry about safety, afraid their dog may choke. Other people are concerned about resource guarding. Legitimate concerns. I think chewing is a good outlet for dogs and with some education, you can be more confident about your own House Rules for Chews. In the first place you need a sense of your dog’s chewing style. Chewing force or intensity is not always related to the size of the dog. If your dog is chomping down with those back teeth, he needs a bone that is too big to get between his jaws. If your dog is a very hard chewer perhaps you should limit his chewing to hard rubber toys. Look at Cluny. He opened this all by himself and I didn’t need to read the label to know what was in box! The type of chew your give your dog makes a difference. There are dog chews made from every part of an animal: snouts, ears, pizzles (you know what I mean), hooves, tendons, kneecaps, femurs, tracheas and lungs. I order a variety of items, including tripe spirals, snouts and tracheas. I avoid straight bones, like femurs or those sterilized bones. With enough force, those can splinter and leave sharp, dangerous edges. Rawhide (made from the animal hide) seems to be one of the most controversial chews. As it softens it can break off into chunks that are easily swallowed and can cause a blockage. In addition imported rawhide is usually processed with arsenic, formaldehyde or other toxins. Processors claim this is necessary as a preservative. If I buy rawhide I am very careful to only buy product made in the USA. The Wholesome Hide website has an informative video on how their rawhide is processed, with no toxins. One product category that has become very popular in the last few years is antlers. Antlers are available from deer, elk and sometimes moose. A vendor told me that some dogs have a preference for one over the other. So if your dog rejects deer, you might try elk. Some places sell the antlers split so it is easier for the dog to access the “marrow”. This might be a good idea the first time you introduce antlers to your dog. The nice thing about antlers is that since they regenerate no one has to die. The second new and popular product is the himalayan dog chew. These are made from yak milk that is hardened. These are pretty long lasting and easily digestible. The first time I introduced this to The Boys they had no interest. But after so many raves from friends (and their dogs), I tried again. Success! I usually limit The Boys to an hour at a time with these. Keeps it special and a large can last for three chew sessions. Additional resource: The August 2003 issue of Whole Dog Journal contains an article on recreational bones for dogs. You can access this through their archives. Posted by rockindogz on December 14, 2011 in Dogz at Play, Favorites and tagged dog bones, dog chews, dogs.